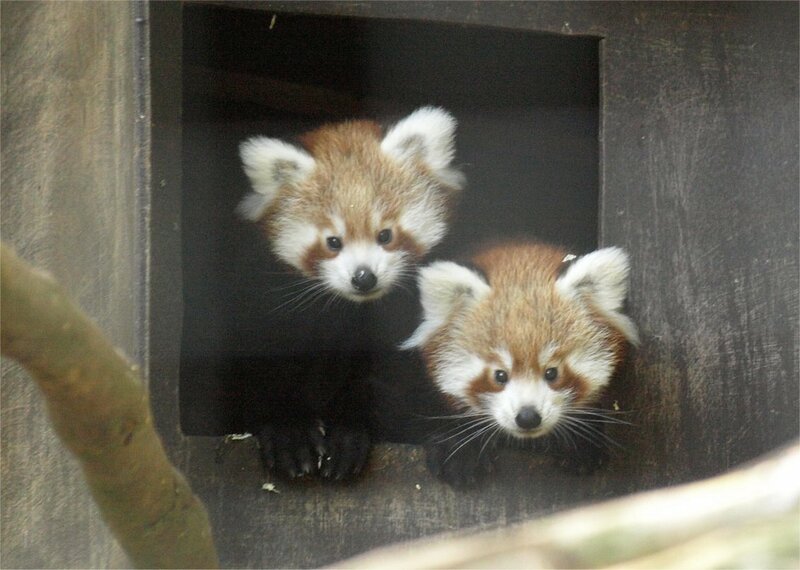 International Red Panda Day 2013! 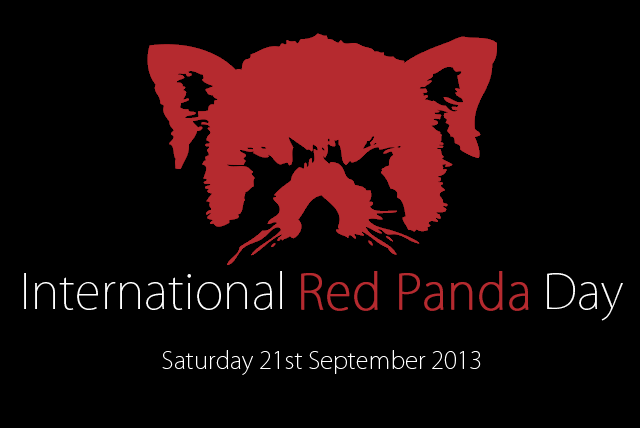 21st September 2013 was The Red Panda Network’s: International Red Panda Day. I knew The Welsh Mountain Zoo was celebrating the event so I managed to get David to agree and on Saturday, early morning we headed for north Wales and the A55. The one and a half hours travel from Liverpool passed by quickly as a warm Autumnal sun shone down upon us and the green of the Welsh hills seemed all the more greener! We arrived at the zoo at 10am and subsequently made our way to the Red Panda enclosure, their enclosure at present is only temporary as a new one is being built for them. I was glad to hear this as the cage was small and the fence was difficult for my camera to focus through. However, Ming Ming as usual was running around the enclosure, open mouth panting. His female companion was asleep in a nest box at the top of the cage. 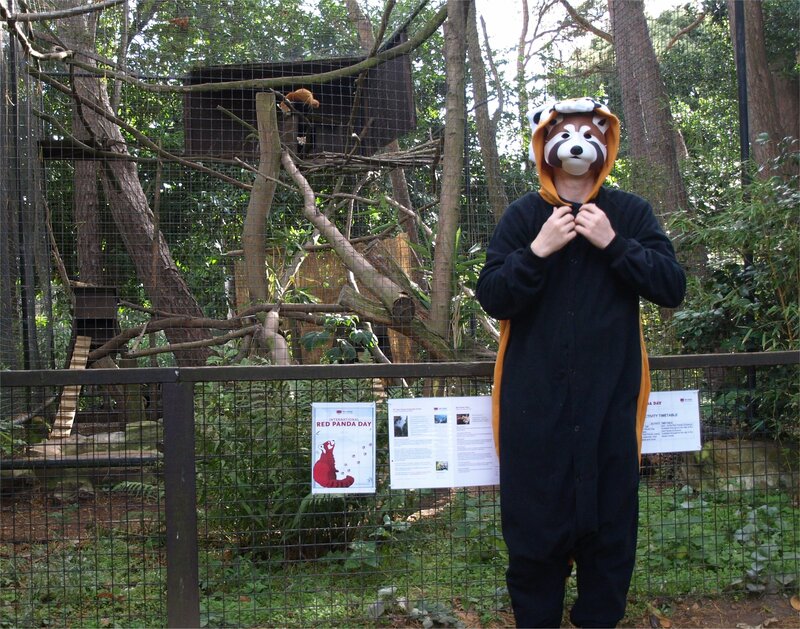 In celebration of International Red Panda day, David donned on a panda onesie and posed in front of the Red’s enclosure! He did get a few strange looks from the other zoo guests! Back to the Red Pandas and after taking an abundant video and camera footage of them, David exclaimed, ‘there’s three of them! There’s a baby!’ Needless to say I was all excited! The three month cub kept poking it’s head out of the nest and looking at the world outside. It won’t be long before he/she will be brave enough to venture out itself. On our second visit to the Red Panda enclosure after taking in the Penguin Parade, David remarked that there was not just one baby but two! Two cubs for Ming Ming! I was overjoyed! We stayed for the 2pm panda talk and even had a nice chat to their keeper. The 2013 International Red Panda day turned out to be very enjoyable. Wales was bathed in a glorious late rush from Summer, the Red Pandas were energetic (unlike most Red’s just asleep in a tree all day), and then there was the addition of the two cubs! I came away from the zoo still in love with Red Pandas as I ever was. They are definitely a species worth fighting for!